It was hard to get excited when BMW presented the new 6 Series GT. Yes, it looks marginally better than the hideous hunchbacked 5 Series GT with its sloping lines and updated design language borrowed from the 6 Series, but there’s still a lot of room for improvement. We were hoping that we would warm to the design after seeing it in the metal at this year’s Frankfurt Motor Show, but suffice to say we’re still not sold. Being situated next to the beautiful BMW Concept Z4 probably doesn’t help matters, admittedly. The BMW 6 Series GT is based on the same scalable CLAR platform underpinning the new 5 and 7 Series, as well as the new upcoming 8 Series, which uses high-strength steel, aluminum and carbon fiber materials to make it as strong and lightweight as possible. At the front, not much has changed from the 5 Series GT, as the 6 Series GT features a virtually identical grille and headlights. From the side profile, however, it looks more attractive thanks to its sweeping roofline and coupe-style shape, but it’s still hardly a stunner. Fortunately, the spacious interior nearly redeems the 6 Series GT’s polarizing looks, with luxury materials and semi-autonomous technology on a par with the new 5 Series. The seats are upholstered in Dakota Leather, and the cargo space has been significantly improved. With the seats up, the 6 Series GT offers 31 cubic feet of cargo space compared to 18.7 inches in the 5 Series, and 65 cubic feet with the rear seats folded. Buyers can opt for either the Luxury or M package, with the latter adding an aggressive body kit, a leather steering wheel, aluminum pedals and either 19- or 20-inch wheels. Power recline is added to the rear seats in the Luxury package. The M Sport pack adds an aggressive body kit, a leather steering wheel, aluminum pedals and a choice of 19- or 20-inch wheels, while the Luxury pack adds power recline to the rear seats. 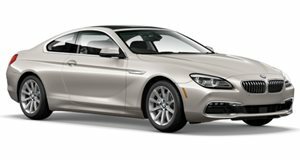 In the US, the BMW 6 Series GT will be sold exclusively in 640i xDrive trim, packing a 3.0-liter twin-turbo inline-six with 335-hp and 332 lb-ft of torque mated to an eight-speed automatic. 0-60 mph takes 5.1 seconds, which is slightly slower than the sedan's 4.9 second sprint time. The new BMW 6 Series GT arrives in dealerships this fall starting at $69,700.